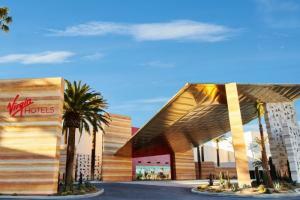 Hard Rock Hotel & Casino offers an energetic entertainment and gaming experience with the services and amenities associated with a boutique luxury resort hotel. Features of the property include an 11-story Hard Rock Hotel tower with 640 guest rooms, 17-story Paradise Tower with 490 rooms and suites and the all-suite HRH Tower with 359 suites, eight spa villas and seven penthouse suites. The new Kelly Cardenas Salon, located in the HRH all-suite Tower, brings a mix of rock ‘n’ roll, fashion, and luxury to Hard Rock Hotel and Casino. The beauty destination offers services such as haircuts, color, blowouts, and more, and features Paul Mitchell Salon Products. Located about two miles from McCarran International Airport, and approximately one mile from the famous Las Vegas Strip.